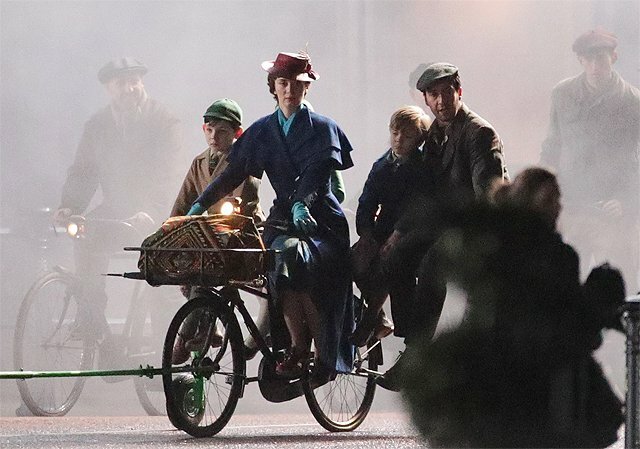 Mary Poppins Returns just outside London’s famous Buckingham Palace in this fresh batch of set photos for Disney’s fantastical continuation. Coming to us by way of Metro, up above you’ll get another sneak peek at Emily Blunt in the title role, who picks up the suitcase, magical umbrella and iconic pink hat first donned by Julie Andrews all those years ago. Pitched as a sequel and definitely not a remake – unlike, say, Disney’s recent box office smash, Beauty and the Beast – Mary Poppins Returns is set against the Depression-era London of the 1930s, where Jane and Michael Banks are now all grown up and have children of their own. That doesn’t exempt the Banks siblings from a visit from Blunt’s lovable nanny, though. And now that filming continues apace in the English capital, these set photos tease a number of extras dressed in period garb. They can all be seen riding bikes close to the Victoria Memorial, with Emily Blunt’s Mary Poppins leading the charge. She’s joined by Hamilton mastermind Lin-Manuel Miranda, who signed on in the role of Jack the lamplighter, and we know that the Mouse House’s long-awaited sequel is also set to introduce a whole host of whimsical characters pulled from PL Travers’ beloved novel saga – namely the eccentric cousin Topsy, who will be brought to life by the great Meryl Streep. The film is set in 1930s depression-era London (the time period of the original novels) and is drawn from the wealth of material in PL Travers’ additional seven books. In the story, Michael (Whishaw) and Jane (Mortimer) are now grown up, with Michael, his three children and their housekeeper, Ellen (Walters), living on Cherry Tree Lane. Directed by Into The Woods helmer Rob Marshall and also starring Ben Whishaw, Emily Mortimer, Julie Walters, Colin Firth, expect Mary Poppins Returns to open on Christmas Day, 2018.